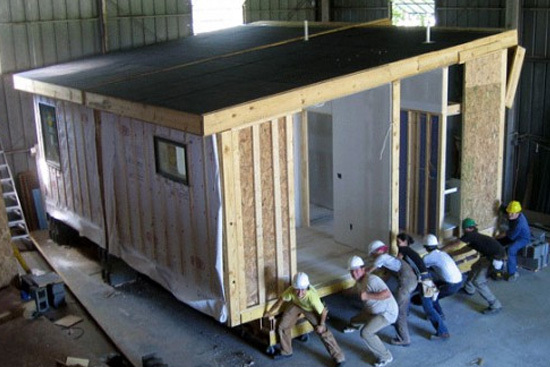 University of Virginia students take part in construction of a prefabricated, ecological, and affordable home of their own design. The ecoMOD studio’s central issue is ecology. The design incorporates cisterns to collect up to 3,400 gallons of rainwater made potable for use in the residence. A sleeping porch as well as the home’s many windows, oriented to optimize passive heating and lighting, add to the blurring of indoor and outdoor areas. As the construction wraps up this month, Assistant Professor John Quale is already planning construction of future homes. Currently, he is teaching “Evaluating ecoMOD,” a course that monitors the home’s success. Quale and his students are looking at the residence’s thermal environment and energy use, as well as analyzing the life cycle of the building and landscape. They will also conduct a postoccupancy evaluation, and interview owners, neighbors, and EcoMOD’s client, the Piedmont Housing Alliance. The Environmental Protection Agency selected the UVA team to compete for the P3 Award, a student design competition for sustainable design; a win would mean additional funding for two more homes. The goal of subsequent studios, currently scheduled for the fall semesters of 2006 and 2007, will be to bring good design to lower-income housing. Students in these studios will create original designs using the information gathered from the OUTin residence to inform their decisions. Quale would eventually like to see a builder adopt the designs for more widespread use, but for now change comes one structural insulated panel at a time.